Not my finest, but I was kicking but the first mile and a half. It was about 10 AM, 90 degrees and very bright outside. I felt very energized at first, RunKeeper was praising me for being well ahead of my target pace and I was feeling good. Then I hit a mini wall and had to walk for about 100 feet after 1.5 miles. I was able to pick back up and complete the run even at a slightly improved average pace – so that rocked. But the heat did get to me and forced me to slow down. Anyway, my dad has come up with a great Christmas gift idea for my two sisters and I (finally! ), he gets us each gift certificates to the same restaurant and offers to babysit their kids so we can can have an adult night out together with our husbands. Sadly it’s taken us until July to finally find a night this year when we could all get together and Saturday night was that night. The problem is he picked a restaurant that he really likes this year, forgetting that we’re not really huge beef eaters and I don’t eat meat at all anymore – Cattlemen’s Steak House. I wasn’t too worried, at worst I could order an item or two from the appetizers and sides sections, but they did have something on the menu for me. 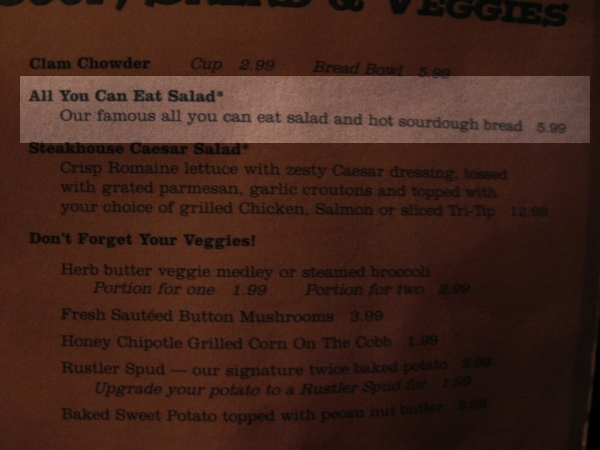 All you can eat salad for only $5.99?! Oh, they must not know me because I will get my moneys worth! :-P What was great was most of the steak entrees were $20+ each, many over $30 and mine cost $6. And it wasn’t horrible. 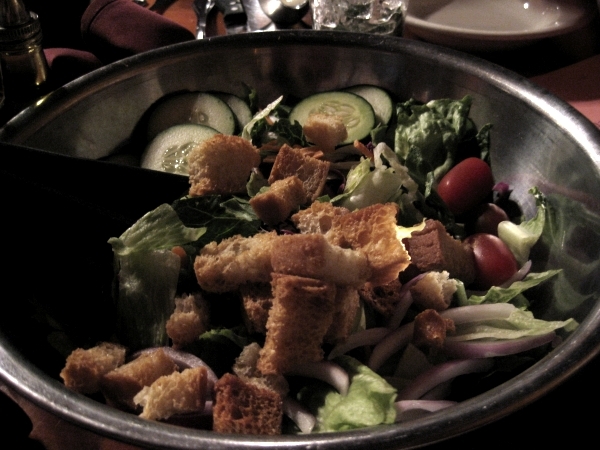 Okay, the iceberg lettuce was weak and the croutons were excessive, but it had a decent amount of tomatoes, cucumbers, onions and cabbage with simple balsamic vinegar and oil on the side for dressing. I was worried a restaurant like this would only give fat-loaded cheap ranch and thousand island as the dressing options. I guess a lot of people would consider this a disappointing meal to get at a steak house, but it was fine for me – I was going to enjoy the time with friends and family and was the only one not leaving with a painful beef and potato baby or a big dent in my wallet. The smells of steaks and piled baked potatoes did nothing for me and I just really enjoyed spending time laughing and catching up with loved ones. 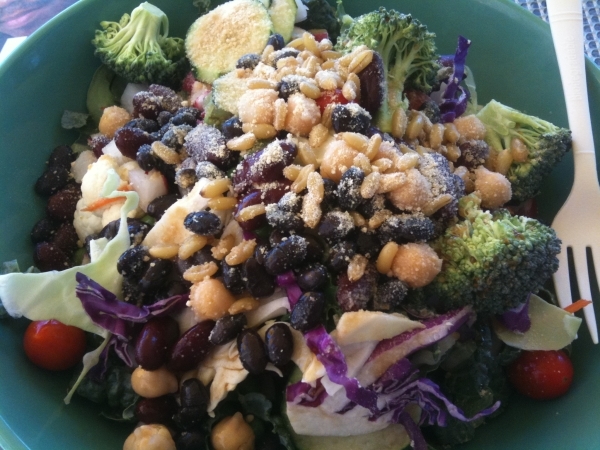 For lunch yesterday, I met my mom and sister at Whole Foods for a little shopping after consuming this work of art. 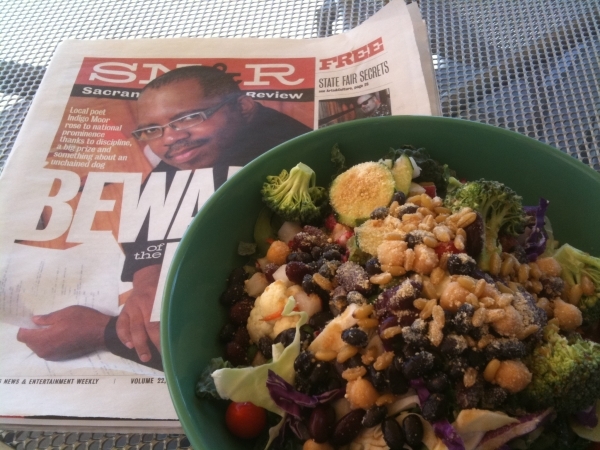 I guess I had to make up for the veggie-lacking salad Saturday night – spinach, cabbage, broccoli, cauliflower, cucumbers, tomatoes, corn, chickpeas, black beans, kidney beans, carrots, kale – basically a little bit of everything dressed with Braggs Liquid Aminos and vegan nutritional yeast topping – very filling and held me until an Italian-themed raw class that evening for dinner. The class was for Italian themed raw vegan recipes and held at an Living Light-trained instructor’s house, I’ve been to several of her classes before and have a binder full of recipes and notes from them. The first sampling was her homemade walnut butter cup. Drooling yet? It just melted in my mouth and was insanely good thanks to perfect walnut butter and coconut oil. I’m going to have to perfect making these myself for hubby because no one should be subjected to cheap, waxy store-bought Resse’s cups when this level of perfection is available and way better for you. Period. 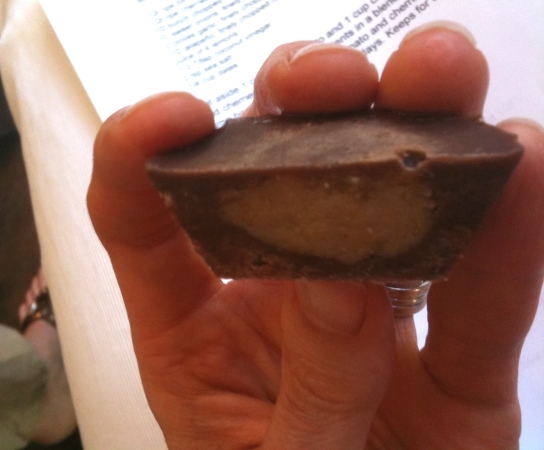 We also learned that chocolate is a great thing to eat before a meal because it’s actually an appetite suppressant – sounds good to me. Next we learned how to make and sampled raw vegan cherry gazpacho soup as well as learned all the amazing health benefits of eating fresh cherries regularly. 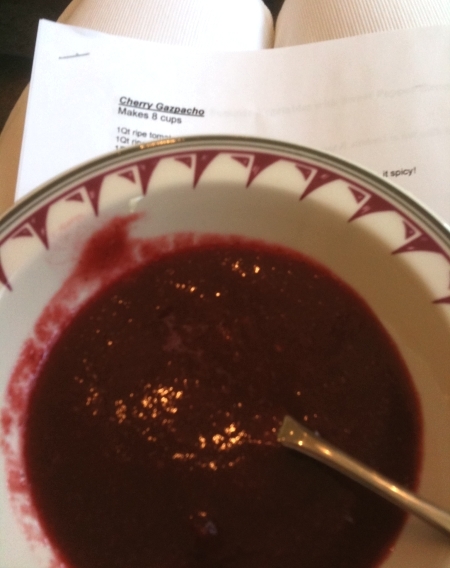 Whew knew fresh cherries and tomatoes blend so beautifully together to make an amazing soup! Ironic that earlier that day I was making fun of the cherry pitting device at Whole Foods thinking I’d never spend money on such a uni-tasker and am now thinking of it just so I can make this soup. 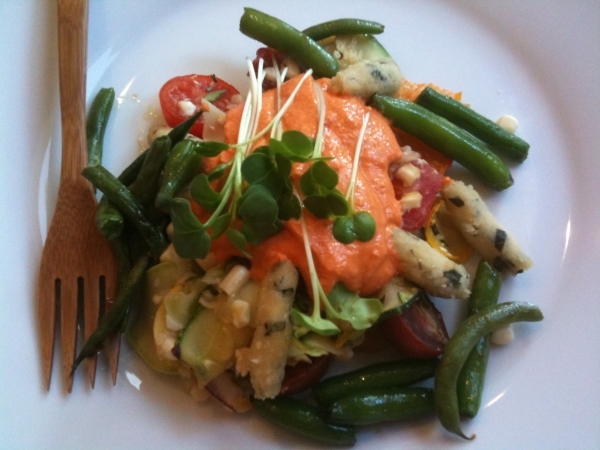 The next dish or main course of the meal – Raw Vegan Basil Gnocchi & Summer Vegetables w/ Sweet Pepper Sauce. The gnocchi is jicama, cashews, homemade cashew flour and seasonings blended together in a food processor, rolled in to little dough rounds and dried in a dehydrator briefly. It’s a recipe I so have to play with and tweak because not only were they amazing, but they’ll also keep in the fridge for a few days to eat from throughout the week. The sweet pepper sauce is cashew cream with coconut meat and it’s just calling me to reboot it with hemp seeds … hmmmm. The dish was amazing and the entire thing could be made a day or two in advance for a dinner parties or quick work week meals. The finale was dessert and it was by far her most amazing dessert. 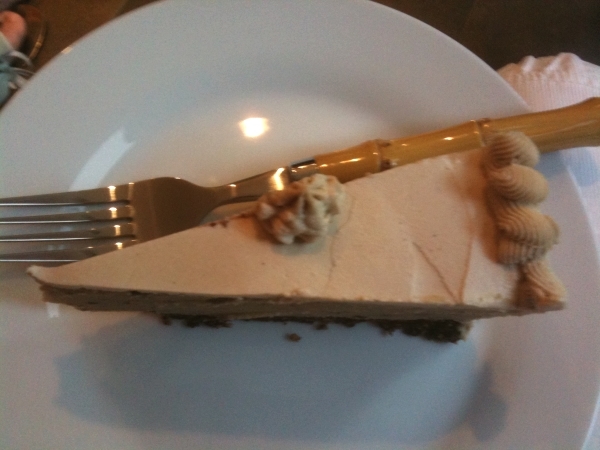 Raw Vegan Ice Kreme Cake and oh my! 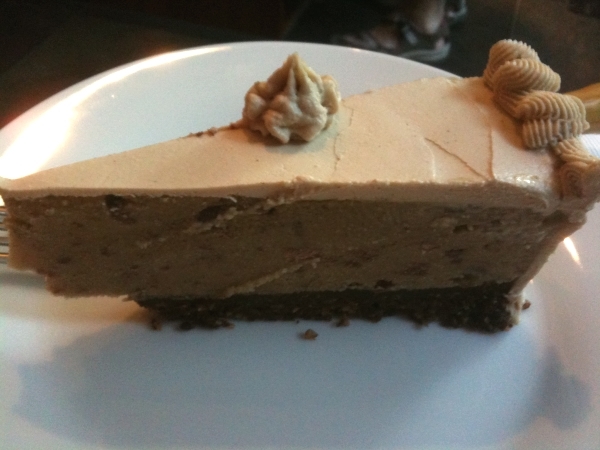 The bottom layer is a walnut cacao based cake with a rich, chocolate flavor. The ice “kreme” center is mint chocolate chip that rivaled the Cafe Gratitude version I had with a punchier mint flavor and generous amount of large cacao nibs. The frosting is cashew and coconut milk based and sweetened with date syrup – simply amazing. Not sure I would make the entire cake together, the ice kreme or cake alone would be amazing to me, but it would be worth the effort for family gatherings and special events. Overall it was another amazing class with lot of interesting discussion from other long-term raw foodies and vegans on health issues, fasting, juicing, detoxing, etc. A lot of hot topics for me this week as I sort through my notes and further research the points brought up. It was about a year ago that I was first exposed to a raw vegan diet at a beginner’s raw class at this same instructor’s house and in fact it was her first class since completing the program at Living Light Academy. 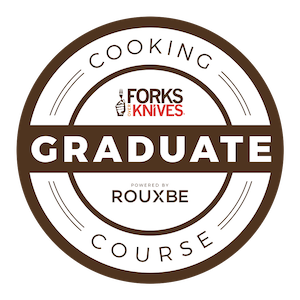 I learned a lot of basics on raw foods and we made almond milk, creamy zucchini soup, raw vegan pad thai and chocolate avocado mousse. Wow, that seems like it was so long ago now and obviously the instructor has come a long way since. I’ve also come a long way in a year with my diet and how I view food and the nourishment it provides being just as important as the flavor. After that first class I didn’t think I could ever entirely give up meat, especially seafood. But that happened naturally as I reduced the animal products in my diet to the point that I no longer missd or craved them, nor do I miss the intestinal trauma they tended to bring for me too which was mainly from dairy products. But yay for a fun weekend! Glad you found something to eat at the Steakhouse– they can be a little tough! Mmmmmm raw gnocchi!! That looks amazing!!! In fact, all of your eats in this post do! So jealous!! p.s. gotta love all you can eat salad bars!! “nor do I miss the intestinal trauma they tended to bring for me too which was mainly from dairy products.”–me too! the raw class, the instuctor coming far in a year..no, YOU sound like you have come really far in a year!! amazing progress! this post is epic…love it! Wow these raw foods look yum girl and you should be proud of yourself for how far you have come, living raw is a hard lifestyle Im sure, but so many amazing benefits too! I bet you feel better than ever! Loving that dessert, looks so good!!! Yes Fazolis is such a guy place, lots of cheap pasta! I dont ever eat pasta, lol, Im italian too, and growing up thats all we ate, and every Sunday My mom would have huge pasta dinners! I think I got sick of it!! Hope you have a great day love!! Oh man, I just want to dive race first into some of those desserts! organizations every weekend where you can learn methods of good dog training. ” and ignore them until your dog has all four paws on the ground. Signing your dog up for classes can be useful if he’s chewing on furniture, barking excessively, or if he just has to be socialized with other dogs and people.